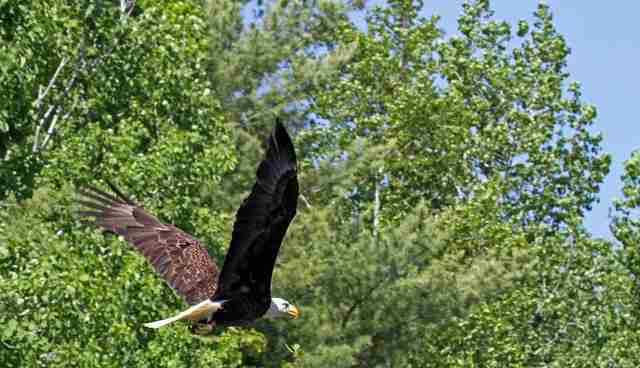 What is the meaning of a bald eagle? They're our national birds, of course, beautiful symbols of pride freedom. Ecologically they're apex predators: they take life, yet in a deeper sense bestow it, their presence making the land more verdant. They are wildness incarnate -- which made it all the more troubling when, on Mother's Day morning, a female bald eagle was found on a sidewalk in downtown Bangor, Maine. She was disoriented and unable to stand, much less fly. Each time she tried, she toppled over again. Photographs of the scene had an almost mythical quality: a being from another world, fallen to Earth, bystanders keeping their distance. When a game warden came to take her to Avian Haven, a regional bird hospital, she didn't struggle. And then, incredibly and terribly, just a few hours later in the same spot, a second eagle died: the female's mate, who took flight from their nest, lost control, hit a high-tension power line and died in a blaze of electric-green light. The two had arrived three years ago, building their nest beside in an old white pine tree, beside an apartment building. To locals, they weren't just symbols. They were neighbors, too, a part of the community. "We considered them 'our' eagles," said Ryan Robbins, who lives in the nest-adjacent apartment building. "We were always keeping an eye on them, telling each other when we saw them and what they ate. We anointed ourselves as their caretakers." Which isn't entirely unusual -- ours is a cultural moment in which dogs and cats and other domestic animals are rightfully regarded as conscious, thoughtful, creatures. They're recognized as persons, in a sense -- but that recognition isn't so frequently extended to wild animals, few of whom we come to know as individuals. But when a pair of eagles moves in, and you watch them build a nest stick-by-stick, and see them as often as your human neighbors ... it gets personal. "I cried for days," recalled Sharon Fiedler, a retiree and wildlife photographer who lives nearby. Last year she saw them mate atop a nearby cliff known as Lover's Leap. "It might sound crazy to some people," said Ryan Robbins, "but it had me depressed for a week." He was standing outside, talking to John Ellis, another of the building's residents, when the male eagle crashed. "I'm a big guy. I'm six-foot-two, 275 pounds. I'm 50 years old," said Ellis, who landscapes for a living and makes country music in his spare time. "And I was just crushed. I had tears in my eyes." Ellis had names for the eagles. The female was Jackie, in honor of his mom, and the male was Nicky, after a man who'd been like a father to him. I felt for the eagles, too. I grew up in Bangor, and still visit frequently. Every few months I'd see one of them -- hunting ducks in winter on Kenduskeag stream, a little ways from their nest and my mom's house, or sweeping low over bare fields in early spring. When I heard about their tragedy, it hit me harder than I would've expected. It was a bit like losing a friend you don't often see, and realize too late how just knowing they were around made your life richer. There was a sense of injustice, too. Once you start paying attention to wild animals, it's hard not to feel protective. They're making their way in a difficult world, one populated by unpredictable two-legged giants whose essential tendency is to cause harm, intentionally or otherwise. Tests were inconclusive, but the eagles appeared to have been poisoned. They'd likely consumed a bait intended for a coyote or a fox, some animal sentenced to death because some people have such a hard time sharing their landscape with the creatures who live there. 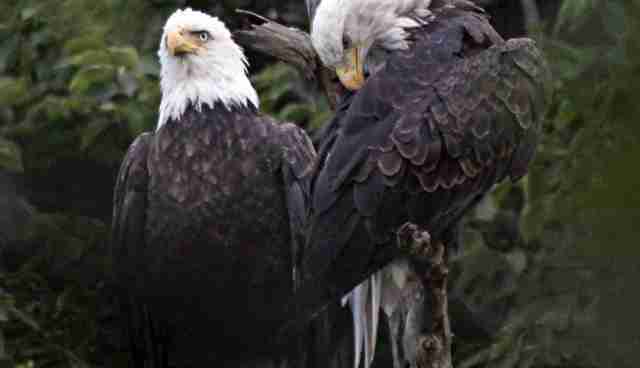 "Whatever toxins those eagles got into, they didn't create it," Ellis said. "We did. And we need to be more responsible with what we're doing in our own backyards." Capable of cruelty and callousness as humans are, though, we're also capable of great acts of kindness. And so a day later, a wildlife biologist climbed that white pine tree, 90 feet high and swaying in the wind, to rescue two eaglets from the nest. Fortunately they hadn't shared their parents' last meal. The eaglets reunited with mom at Avian Haven, but she didn't take them back. It's an instinctive response to evolutionary imperatives: raising babies alone is very difficult for a single eagle, so when a partner is lost, they don't try. 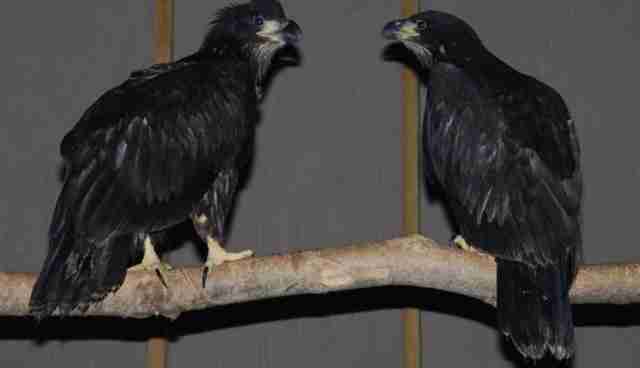 The eaglets are now in a flight cage with other baby eagles, building up their flight muscles under the tutelage of a crippled adult found several years ago by a member of the Penobscot Indian Nation. 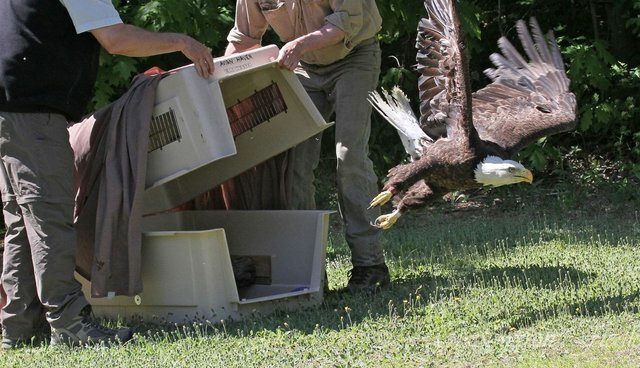 "They're learning their manners, so to speak," said Avian Haven rehabilitator Mark Payne. "He keeps them in line." Later this year they'll be put back into the wild. As for mom, it took her three weeks to recover. Early in June she was taken to the banks of the Penobscot River, just a few miles from her old Kenduskeag home. "She just pushed off and flew over the ground and kept rising," said Robbins. "It was so quiet. All you could hear were her wings beating the air. She was just focused straight ahead. She didn't, corny as it sounds, look back." Photo: Sharon Fiedler On a morning not long after, I was walking by the Kenduskeag when I heard a strange sound: frantic caws of crows proceeding sequentially downstream, as though they were passing on some urgent news. A minute later, I heard the soft, powerful sound of large wingbeats. Through the treetops I glimpsed a bald eagle, head shining in the sun. Was it her? I couldn't be sure, but others have seen her, too, and identified the band on her leg. She appears to have a new mate. Mom is home again.